According to Acting U.S. Coast Guard Historian Scott Price, the U.S. Coast Guard considers August 4th, the date the U.S. Revenue Marine Service was created in 1790, as their official birthday not the January 28 date when their name was changed in 1915 (see Scott’s January 28 blog). The U.S. Coast Guard acquired its new name when the federal government combined the U.S. Life-Saving Service with the U.S. Revenue Cutter Service. Originally called the U.S. Revenue Marine Service, this early “U.S. navy” was “tasked with coastal surveys and exploration, saving life and property at sea, defending United States territorial waters, enforcing customs (tariff) and smuggling laws, and collecting the customs duties from international trade and shipping to fund the federal government” (source: United States Coast Guard Leaders and Missions, 1790 to Present by Thomas P. Ostrom and John J. Galluzo, pp. 7-8). A fleet of revenue cutters was constructed to enable performance of these duties. The Revenue Marine Service also aided the early lighthouse service in setting up and servicing buoys, choosing sites for lighthouses, and reporting on the efficiency of the lights and other aids to navigation. The U.S. Coast Guard mission has expanded greatly in the past 100 years. In addition to lifesaving, enforcing maritime law, and national defense, it oversees aids to navigation, protects the marine environment, supports scientific research at sea, keeps ship channels free of ice, responds to oil spills and other marine disasters, ensures port security, and combats terrorism. As many of you know, Bob Browning retired as the U.S. Coast Guard Historian earlier this year. Scott is now acting historian. Having been with the office 22 years, Scott has acquired an in-depth knowledge of Coast Guard history and has helped countless researchers (including myself) with a multitude of topics. In his new role as acting historian, Scott is very interested in exploring ways to increase the office’s outreach, promote inter-agency cooperation, and “show the flag” to make the Coast Guard Historian’s Office a more visible entity. He is responsible for the extensive website devoted to Coast Guard history. The site is an invaluable resource for researchers and I regularly visit it for information (and photos) on lighthouses, lifesaving stations, vessels, and other U.S. Coast Guard assets. To reach an even broader audience, Scott has recently started using a twitter account. 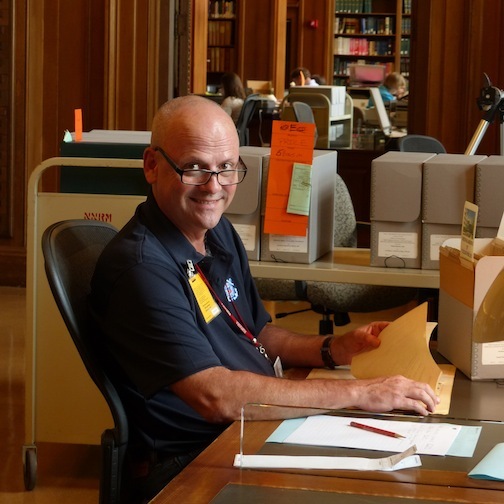 So I am including Scott Price in my “Modern Day Lighthouse Keeper” category for his work in promoting U.S. Coast Guard history and making their records accessible to both researchers and the general public. This entry was posted in Lighthouse administration, Modern Day Lighthouse Keeper, Research, U.S. Coast Guard on August 4, 2015 by lighthousehistory.